The Tamworth pig is a golden-red coloured pig with a long head, prick ears, a straight face and snout and a long, narrow body. It is a very hardy animal, making it especially well matched to adverse climates like that of Canada where they do well even during severe winters. The first Tamworths arrived in eastern Canada in 1877 from Europe. One of the oldest pig breeds in Europe, the Tamworth is the most direct descendant of Europe’s native pig stock. It originated in the Midlands of England in the early 1800s. The breed was popular on many Canadian farms, from east to west, until the mid-20th century. It was appreciated as a low-maintenance breed and described as an “easy keeper.” Tamworths are ideally suited to outdoor production, grazing compatibly with cattle, being able to retrieve forage that cattle leave behind in the open pasture. In addition, they are very efficient at rooting for food in the forest or pasture, making them ideal for forage-based farming systems. In addition to their tolerance for extreme temperatures, they are also resistant to disease, needing little if any treatment with antibiotics and their ginger colour protects them from sunburn. In fact, Tamworths are sometimes bred into the standard breeds to increase mothering instinct and disease resistance. Sows are noted as attentive, good mothers to their piglets with litters ranging in size from six to ten piglets. They are also known for their good disposition and enjoy human attention. 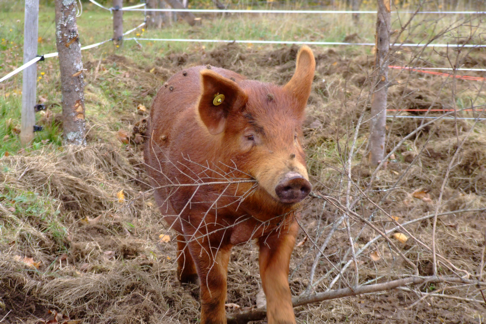 Tamworths are favoured by bacon curers because of their length and depth of sides, light waist, and their large portion of lean red meat to fat. However, the Tamworth is highly adaptable and suited to both quality pork and bacon production, particularly in grazing operations. The meat is nutty and sweet, with a depth of flavour not found in most pork today. The depth of flavour is due in part to the Tamworth’s natural propensity as a forager, so it consumes a wide variety of foodstuffs unlike industrially raised pork. A Bristol University taste test, under scientifically controlled conditions, rated Tamworth meat as the best when compared with other rare breeds and commercial pork. The flavour of the meat alone that makes this heritage breed worth growing slowly. They take 50% longer than commercial pigs to grow to market weight. By the 1950s Tamworths accounted for 5-10% of the pure breed swine population (or approximately 1700 purebred registrations) in Canada, but today their numbers have declined dramatically. Regulations against keeping pigs in barns with dairy cattle, new systems of grading pork and the introduction of large-scale confinement rearing systems, in which Tamworths do not do well, contributed to the decline of the Tamworth in the last 40 years. Estimates today put the Canadian population of Tamworth pigs at well under 500 registered animals. Between 2001 and 2005 there were only 92 new animals registered in the entire country. Raised today by a small number of dedicated producers, the Canadian Tamworth population is in critical danger. With the world population of Tamworths estimated at under 4,000 it is essential that we do our utmost to protect this breed and encourage production. The Tamworth is a part of Canadian agricultural heritage and we hope that by adding it to the Canadian Ark of Taste we can increase knowledge and support of this wonderful heritage breed and spur additional production that will not only preserve the current population but also ensure its success in the future. Corner of Cleveland and Victoria St.
Where can this be. Purchased in the Edmonton Alberta area?